Sakshi has created the Picture-I and Picture-II as shown in the given image in MS-Paint of Windows 7. Now she wants to move Picture-II inside Picture-I as shown in Picture-III. Which of the following steps will help her to do so? 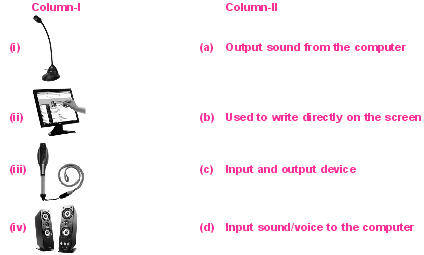 Match the following devices shown in column-I with their functions in column-II. Sometimes, you see that the 'Track Changes' feature in MS-Word 2010 is unavailable, this is because ___________. AYou have turn ON the document protection feature. BYou have added new comment. Should'nt the answer be A? Hi!The answer can't be 'c' because I have seen track changes being used at home for almost only comparing documents. A file's summary, Author, Date Created, and Disk Size are known as __________. Which of the following statements hold true about the given icon with respect to MS-Word 2010? Statement 1 : It insert picture from a file. Statement 2 : It is called as ‘Text Box’. What does a badge mean? check it on www.sof.org, click view results, enter your roll no. and olympiad, Click view results. Below it you can find second level admit card also. when was 1st PC VIRUS invented?? and by whom?? ?